So they started putting the new lift into our apartment building on Monday and I decided it might be fun to see which one of us goes up/down the most stairs in the process of this work. Using the stairs hasn’t been too much of a problem so far but then again I haven’t done any shopping either! So up till today I have done 1088 stairs, it would be so easy if I lived on the 5th floor, up to 5 is easy, after that not so much. The headache is from all the drilling, they are taking out the mechanism, which is just one floor above me, feels like its in the same room, it feels soooo good when it stops! I knew at the time that the two colour part of this cardi was too tight but was kidding myself that it would be okay, finally the shouting got loud enough for me to hear so riiiiip it went, maybe for summer. I bought turquoise and brown yarn for Matilda Jane, pics of that soon too. 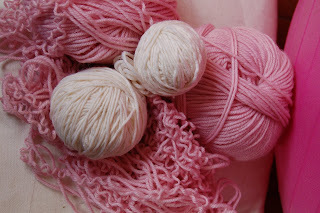 I was looking at knitting the knee high socks from Rowan 40 but who knows how well the 4ply soft wears? Or stays up for that matter or do you really need the ribbons? I am off home to Scotland next weekend, I will be at the craft fair on Saturday, let me know if anyone else is going to be there, more soon ……. I wasn’t going to go, but if you fancy meeting up for a coffee?? i’m so jealous that you are going to the craft fair!!! in scotland of all places…my favourite!! grump grump grump. why can’t i come too? ps. i have a half written email for you. i hope to get myself out of this funk to actually finish and send it! I have been behind on blogs a bit. If I forgot to comment on your socks, they are gorgeous. 1088 steps? Keep it up, you’ll have buns of steel in mere days.